"'I love seafood and sometimes order the seafood macho appetizer at our local Mexican restaurant as my entree,' says Linda McKee, Big Prairie, Ohio. 'I've tried many times to duplicate those tasty morsels at home--this recipe comes close." Arrange tortilla chips in a single layer on an ungreased baking sheet. 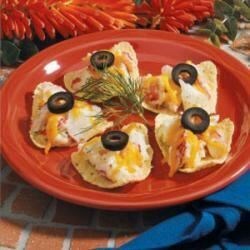 In a bowl, combine the crab, sour cream, mayonnaise, onion and dill; spoon about 1 tablespoon onto each chip. Sprinkle with cheese, olives and paprika. Bake at 350 degrees F for 6-8 minutes or until cheese is melted. Nutritional Analysis: One serving (5 nachos) equals 190 calories, 9 g fat (3 g saturated fat), 25 mg cholesterol, 531 mg sodium, 16 g carbohydrate, 1 g fiber, 13 g protein. Diabetic Exchanges: 1 starch, 1 lean meat, 1 fat. this is a really good recipe. I used real crab and made these for company - they were a hit! Easy, fast, inexpensive, and delicious! This one has it all. Thanks for a great recipe!